Pharmaceutical lubricant concentration used in different solid oral preparations for lubrication during manufacturing. Lubricants are agents added in small quantities to tablet and capsule formulations to reduce the friction and improve certain processing characteristics. Decrease friction at the interface between a tablet’s surface and the die wall during ejection and reduce wear on punches & dies. Enhance product flow by reducing inter-particulate friction. Low Shear Strength- Want the lubricant to hear during blending, not the granules or other excipients in the formulation. Able to form a “durable layer” over the surface covered. Have Minimal Adverse Effects on the Finished Dosage Form. Both tablet and capsule required lubricants in their formulation to reduce friction between the powder and metal surface during manufacture. Lubricants are often hydrophobic in nature; Magnesium stearate is commonly included as a lubricant during tablet compaction and capsule filling operation. Its hydrophobic nature often retards liquid penetration into capsule ingredients so that after the shell has dissolved in the gastrointestinal fluid, a capsule-shaped plug often remain especially when the content has been filled by machine as a consolidated plug. A number of mechanisms have been discussed for these boundary lubricants, including that lubricants are the substance that shows a low resistance towards shearing. The most effective of the boundary lubricants are stearic acid or stearic acid salts primarily magnesium stearate. 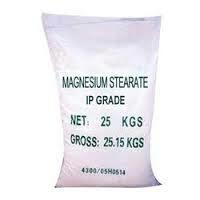 Magnesium stearate has become the most widely used lubricant owing to its superior lubrication properties. The stearic acid salts are normally used at low concentration. Besides reducing friction, lubricants may cause undesirable changes in the properties of the tablet. The presence of a lubricant in a powder is thought to interfere in a deleterious way with the bonding between the particles during compaction. Lubrication is achieved by mainly two mechanisms fluid lubrication and boundary lubrication. In fluid lubrication, a layer of fluid is located between and separates the moving surfaces of the solids from each other and thus reduces the friction. Fluid lubricants are seldom used in tablet formulations. However, liquid paraffin has been used, such as in formulation for effervescent tablets. Boundary lubrication is considered as a surface phenomenon, as here the sliding surface is separated by only a very thin film of lubricant. The nature of the solid surface will, therefore, affect the friction. In boundary lubricants, the friction coefficients and wear of the solids are higher than with fluid lubrication. All substance that can affect the interaction between sliding surfaces can be described as boundary lubricants, including adsorbed gases. The lubricants used in tablet formulation acting by boundary lubrication are fine particulate solids.